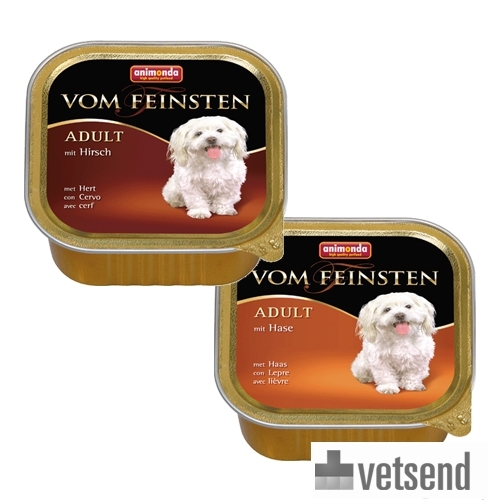 Animonda vom Feinsten Forest tubs of wet food for dogs, in venison and hare flavours. Animonda Vom Feinsten Forest dog food has tasty game (venison and hare), which all dogs will enjoy. The wet food tubs contain only meat, no grains, no soy and no artificial colourings or preservatives. This makes the wet foods from Animonda very popular with dogs. The tubs contain 150 grams of meat. Venison: Meat and animal derivatives (14% venison), minerals. Hare: Meat and animal derivatives (8% hare), minerals. Have you used Animonda Vom Feinsten Forest before? Let us know what you think about this product.